Oil & Tanker Trades Outlook presents the oil trade the way the shipowners see it, combining tanker demand with a detailed monthly analysis of the tanker fleet. The oil trade presented the way ship owners see it. 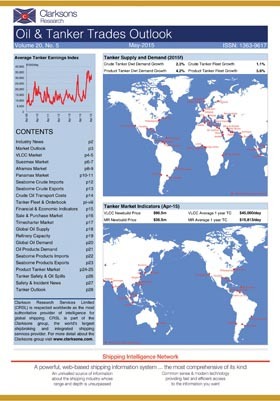 The front of the report tracks tanker demand. The crude oil trade is split into long haul and short haul elements and regional trade flows are used to estimate demand for crude and product tankers. Detailed tables and commentary highlight trends. To complement this demand analysis, the middle section of the report contains a detailed monthly analysis of the tanker fleet, covering 20 size groups.